Let’s take a look at the purchasing side of Acctivate. The Vendor Purchase Order window streamlines the complexities of purchasing management by allowing the purchasing process to be accomplished through this window. From the icon bar: You can also click the Purchase Order button. The Purchase Order window opens into a blank form, in which an existing purchase order can be opened or a new one can be entered. From the Purchase Order window, a request to purchase goods or services can be entered initially and after approval the purchase requisition can be converted to a request for quote or directly to a purchase order. Click the New button to begin the purchasing process. The PO Number field will automatically populate with a purchase order number that can be tracked within the system. In the Status field, we will select Request for quote (RFQ), if it is not already selected. Click the Lookup button to the right of the Supplier field, which will open the Find Vendor lookup window. In the second field near the top, select begins with, in the third, type M and from the data grid select Martin Office, by double-clicking its row. The Supplier Address and Ship to Address automatically populate, but these can be easily overridden if necessary. You can also click on the pin to populate the address in Google Maps. While on the Detail tab to enter the products to purchase. In the first row, click in the Product ID column field and click the button that appears. The Find Product lookup window opens. If not already set, select Product ID from the first Find Product Where field at the top. Near the bottom of the Lookup window, click the Lookup button to the right of the Supplier field and select, Martin Office. This will filter the products in the Lookup window to only show products Martin Office sells. Select the third product in the list, B18. Close the Product Note popup. This is a note saved in the Product Information window that serves as a reminder to the order entry personnel. In the Ordered column field enter a quantity of 10. Notice the unit is set to Cs (Case), so this product will be purchased by that unit. This is a different unit than how it’s stocked and sold. Within the Detail tab, select the product row for B18 by clicking on the pencil box on the far left of the row, then click the View Product button to open the Product Information window to view the multiple alternate units of this product. In the Product Information window, look near the right, where the Stocking Unit is located. You will see that this product is stocked and sold by the each (Ea) and purchased by the case (Cs), which is equal to 6 eaches and the unit we are using on the PO. Close the Product window to return to the Purchase Order. If you have not already done so on the Purchase Order type a Price of $2.00 into the Price field. In the Purchase Order window, click the Save button. The RFQ can then be emailed directly from the Purchase Order window or printed and mailed to the vendor to fulfill the request. Upon receipt of vendor pricing and vendor selection, a purchase order can easily be created, just click the Edit button on the existing PO and change the status to Issued and Save it. Notice a record is kept on the Purchase Order in the Additional Info tab of who originally entered it, who changed the status and who issued it. Only users with appropriate permissions will be able to perform these tasks. Upon receipt of the shipment, the items can be received into inventory directly from the issued PO. From the previously entered PO click the Receive button from the window’s toolbar. The Inventory Receipts window will open for the specific PO with the product already entered to receive the outstanding quantity of 10 cases. This is the only inventory transaction that can be processed in an alternate unit of measure (i.e. the vendor’s unit or any other). Other transactions are processed in the stocking unit. Receive in the product and post to inventory by clicking the Post button. Click Yes from the prompt to post the transaction. The Report Selection Criteria window will automatically open to preview and/or print the Inventory Receipts Transaction report. Click Preview. Notice both the received quantity (by the case) and the stocking quantity (by the each) are on the report. Close the report and the Inventory Receipts window. From the Purchase Order window’s toolbar click the Refresh button, if you don’t see the received quantity update. In the Detail tab, notice the PO’s outstanding quantity is no longer 10, but the ordered and received quantities are now 10. Upon receipt of the invoice, the vendor invoice is entered in Acctivate using the Purchase Invoice window. This window can also be initiated directly from the PO by clicking the Invoice button. The Purchase Invoice window opens for the PO. At the bottom of the window, enter the vendor Invoice Number as 123456; and enter the Invoice Date as the current date. Notice that the received quantity of B18 has been recorded in the Received column and that quantity will post to accounts payable as indicated in the Amount Approved column. Click the Save button. Create the purchase invoice, by clicking the Create Invoice button from the window’s toolbar. Select Yes on the prompt, if the Purchase Order is complete. Close the Purchase Invoice window. On the Purchase Order window, select the Invoices tab to see the Purchase Invoice. The user must synchronize the Purchase Invoice to QuickBooks to view all the details within. Also, notice that the Purchase Order has been completed as marked in the Status field. Close the Purchase Order window. Another way to create a purchase order is to use the Reorder Function built into the core system. This function recommends items to be purchased based on established stocking levels and primary suppliers and then creates a consolidated purchase order for each vendor with one click. From the menu: Go to Alerts > Business Alerts. From the icon bar: Click the Alerts button from the icon bar. The Business Alerts window is one of the powerful Decision Support Tools in Acctivate, which alerts users of issues, such as at-risk deals, customer service issues, low stock or any other item needing immediate attention. We will deal with the inventory management alerts. From the Business Alerts window, select the Inventory Mgmt tab, which contains all products that are currently below the designated restocking level. Notice the Reorder button on this tab. This is where the Reorder Function is accessed, in order to reorder any low stocked items. Click the Group by vendor check box near the top and notice the grouping of the listed products by vendor. Expand Adams Paper to reveal products that vendor sells. Let’s reorder the #10 and Manila Envelopes. Select the checkbox to the left of Adams Paper to select all products ready to order. Scroll to the left in the window to see what will be entered for the PO Supplier, PO Cost and PO Quantity for the product. These can be edited as necessary, but let’s leave them as they are. Click Save Selections before creating the PO and click OK on the prompt that appears. Notice the PO Total for Adams Paper is no longer zero. Click Create POs to automatically generate a PO for Adams Paper. Click Yes from the prompt that appears and OK on the following prompt. Notice that in the Inventory Mgmt tab, Adams Paper is no longer listed; this low stock product is now on an issued purchase order for that vendor. This single PO can now be printed or emailed to your vendor. From the main menu select Purchasing and then select Purchase Order from the drop-down menu. 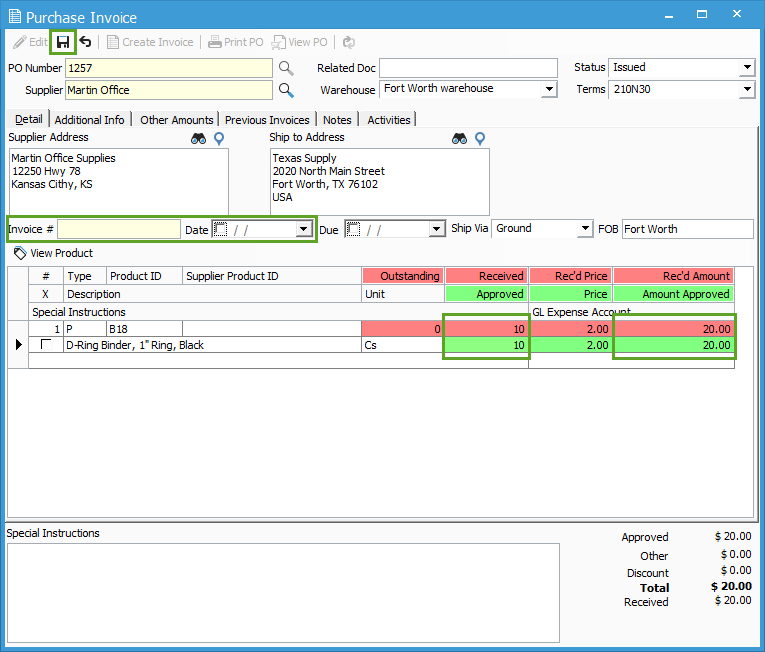 From the Purchase Order window click the Lookup button to the right of the PO Number field. At the top of the Find Purchase Order window, change the first Find PO where field to Vendor Name and scroll down to Adams Paper and select the row with today’s date. Click the drop-down arrow next to the Print button. Notice the option to either print or email the purchase order.